‘Melukat’ is part of the Manusa Yadnya (holy sacrifice which dedicated to human being) ceremony . Melukat aims to cleanse and purify the human body and soul in order to preventing from havoc, bad luck and sickness. The havoc caused by acquired activities and sins, whether originating from the remainder of the previous acts (in the past life / sancita karmaphala) or from acts in his life now (prarabda karmaphala). Melukat derived from the word "lukat", derived on Balinese-Kawi (old Javanese languages) dictionary means "bersihin, ngicalang" (in Balinese language) “to cleanse or purified (in English). In the Indonesian Dictionary, the word 'lukat' means ‘letting go’ (to releasing some stuff), then get the prefix 'me' becomes 'melukat', which means doing a job to release something ‘negative’ in the body and soul, through a religious ritual. The ‘melukat’ ritual means as an efforts of achieving self-purification . These efforts should be sought in accordance with the Lontar (palmleaf scripture)"Dharma Kahuripan" which essentially describes how "human spiritual maintenance", started from the womb until the end of his life. "Adbir gatrani cuddhayanti manah satyena cuddhyati, vidyatapobhyam buddhir jnanena cuddhyatir"
“The body washed with water, the mind cleansed with honesty , the soul cleansed with the science and tapasya, reasonable cleansed with wisdom. " The deep meaning of this verse told that melukat are in use water to cleaning the body physical (sekala) and psychological (niskala) , while for the medium are using "Tirtha Penglukatan", which first filed with Ida Sang Hyang Widhi Wasa (God Almighty) blessings first, through prayer, (puja) worship and (mantra) spell by a priest (peranda, balian or pemangku). aim to cleanse and purify one's evil influence caused by the birth day and Tri Guna (Three material cause on living things=satwam, rajas, Tamas), are not balanced in human body. In accordance with the instructions in Lontar Astupungku. The goal of this ceremony is medical treatment of a person who is afflicted with the disease. This ritual Implementation is done by a Balian or dukun (shaman) who perform traditional treatments. In accordance with’Lontar Putusan Kala Gni Chandra Bhairawa’. the aim is for the redemption of ‘oton’ (day of birth ), caused by bad influences from wewaran and Wuku (day of birth). 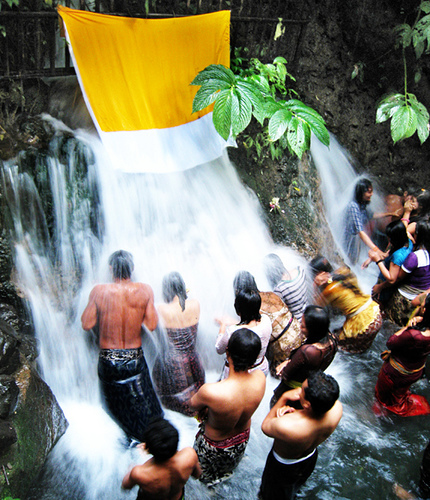 Sapta wara includes Wewaran and Wuku (birth day accordings to traditional Balinese Calendar). the goal is to remove ‘stains’ and ‘dirt’ on baby. The ceremony is held at 'mapetik’ or ‘nyambutin’ (new born), ‘tutug tigang Sasih’ (three days) and ‘nelu bulanin’ (3 months) ceremony . aims to cleanse the kama jaya (the groom) and the kama ratih (the bride) from the ‘stains’ and ‘dirt’ (mala) in pawiwahan (traditional Balinese wedding ceremony). Melukat Prabhu Wibuh and Nawa Ratna aims to ask the leaders, so that in furture they performing their duties to get the glory and prosperity. The ceremony is also called ‘mejaya-mejaya’. The Tirta Empul Temple includes the traditional Balinese split gate along with shrines to Shiva, Vishnu, Brahma, Mt. Batur, and Indra. There is also a large open pavilion in the main courtyard, useful for relaxing in the shade.But the main attraction here is a long rectangular pool carved of stone, filled with koi and fed by the sacred spring via 12 fountains. Worshippers first make an offering at the temple, then climb into the main pool to bathe and pray. Many collect the holy water in bottles to take home. Nearby there are two smaller pools fed by the spring. Overlooking the temple on a hill above is a suprisingly modern building: the Government Palace, built in 1954. Originally a residence for Dutch officials, it was later used by former President Soekarno during his frequent trips to Bali. Pura Tirta Empul is located in the village of Tampak Siring, accessible by public transportation from Ubud. Gunung Kawi is located just 1 km north of Tampaksiring off the road to the right. The location is sign posted as you get close. The entire site sits in a small river valley (the Pakrisan River) and requires you to hike down a set of steps past a few more local vendors. The scenery is pretty with rice fields in view and local women washing their clothing in the small stream as you pass. Pura Selukat in ‘Subak Tuas’ rice field area, the village of Keramas, Blahbatuh, Gianyar. The extent of approximately 8 acre divided into Tri Mandala, which links the side, a compound into the middle and innards. On Utama Mandala (private/sacred space) are Padmasana building, Gedong Penyimpenan and a pair of Maharsi (holy priest)statues. In the compound into the middle (Madya Mandala) there are only a Gedong (building) where there is a shower that channel from the fountain at Selukat Temple . In Gedong Patirtan there is patirtan water source consists of three sources, from the west, north and east. While in the compound into the side of the building there is Pesandekan (resting) and two showers a source of water comes from the Gedong to melukat citizens who come to the Selukat Temple. 7.The Priests Place (peranda, balian (shaman), ashram and pemangku ) or in accordance with their instructions.